We are proud to present to you: the Amsterdam premiere of the award winning documentary Ballad for Syria, by Eda Elif Tibet & Maisa Alhafez. The screening will be followed by a Q&A session and a workshop, by and with Maisa herself. We invite all music- and Syria lovers. And especially those who would like to be part of the Amsterdam-Syrian choir, which will be raised by Maisa in November/December. 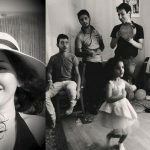 A ballad, narrates poetic stories in short stanzas, hence this self-reflective musical documentary mirrors’ the life of Maisa Alhafez a musician and a Syrian refugee living in Istanbul. The film is about her longing to her loved ones as she tries to make a place for her self in the world of the displaced. Her family still in Syria, Maisa’s true love (fiance) is in the Netherlands. As of the current EU-Turkey border regime, to unite is very challenging. Not giving up, Maisa works hard for her vision to transform the borders; by building a multicultural community “The oriental Istanbul Mosaic Choir”. A diverse family that sings together, in which she believes through music and love one can heal the wounds of her people and children. Book your place at our Facebook page.